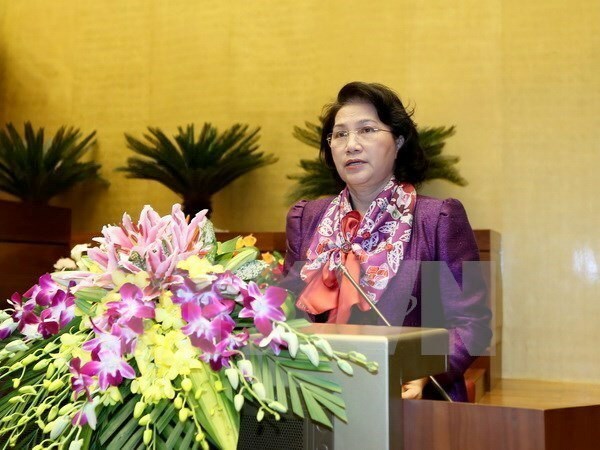 National Assembly Chairwoman Nguyen Thi Kim Ngan will lead a Vietnamese delegation to the United Arab Emirates (UAE) to attend the 11th Global Summit of Women Speakers of Parliament slated for December 11-13. The visit is made at the invitation of President of the Inter-Parliamentary Union (IPU) Saber Chowdhury and President of the Federal National Council of the UAE Amal Al Qubaisi. Vietnam and the UAE established diplomatic ties on August 1, 1993. In October 1997, Vietnam opened a Consulate General in Dubai and upgraded another into an embassy in Abu Dhabi in August 2008. In November 2008, the UAE opened an embassy in Hanoi. The UAE is currently Vietnam’s largest importer in the Middle East and the seventh largest globally. Two-way trade hit 6.3 billion USD in 2015, up 24 percent annually, 5.7 billion USD of which are exports of mobile phones, computers, electronic products and spare parts, footwear, pepper, apparel and seafood. The UAE is also a major investor from the Gulf region with total registered capital of 4 billion USD. More than 5,000 Vietnamese nationals work in the country. The 11th Global Summit of Women Speakers of Parliament, themed “United for Shaping the Future”, will discuss the role of parliaments and women parliament speakers’ involvement in addressing challenges to social progress and prosperity. The first summit of this kind was held on the occasion of the second World Conference of Speakers of Parliament in New York in 2015. Since then, female parliament speakers have met annually to discuss protecting and empowering girls and preventing violence against women and children. This year’s gathering, hosted by the UAE Federal National Council and the IPU, is expected to attract 50 female speakers, helping them network and seek solutions to gender and economic inequality, towards promoting global peace, security and sustainable development. The Vietnamese delegation’s participation in the Summit looks to promote the NA’s role and position at regional and global parliamentary forums and at the same time affirm the policy on gender equality pursued by the Party and State. National Assembly Chairwoman Nguyen Thi Kim Ngan praised the Vietnamese embassy in India for its dedication to bilateral friendship and cooperation during a meeting with its staff in New Delhi on December 8. She wished that the Vietnamese nationals would abide by law in the host country and continue to be an important bridge to foster friendship with India. The Party, State and National Assembly provide all possible support for Vietnam’s representative diplomatic offices abroad to contribute to national construction and development, she said. According to her, the Foreign Ministry recently held a conference to disseminate diplomatic guidelines of the 12th National Party Congress and outline plans for external activities in the coming years. On the occasion, she asked the embassy to review the enforcement of the Law on Overseas Representative Missions and give feedback on amendments to the law to submit to the NA’s fourth meeting slated for October 2017. The leader said the Vietnamese community should exert more efforts to teach Vietnamese language, especially for children of second and third generations in India. Describing the embassy as a nucleus of Vietnamese teaching, the top legislator suggested reporting difficulties to the government to receive support. Vietnamese Ambassador Ton Sinh Thanh, for his part, expressed his wish to further accelerate exchanges between the two peoples.